Alice wanted to do an Alice in Wonderland theme wedding without it looking cheesy or girly. She was convinced the theme wouldn’t work at all and wanted to broom it under the rug. I convinced Alice to let me give it a try and if she didn’t like it, we could do something else. 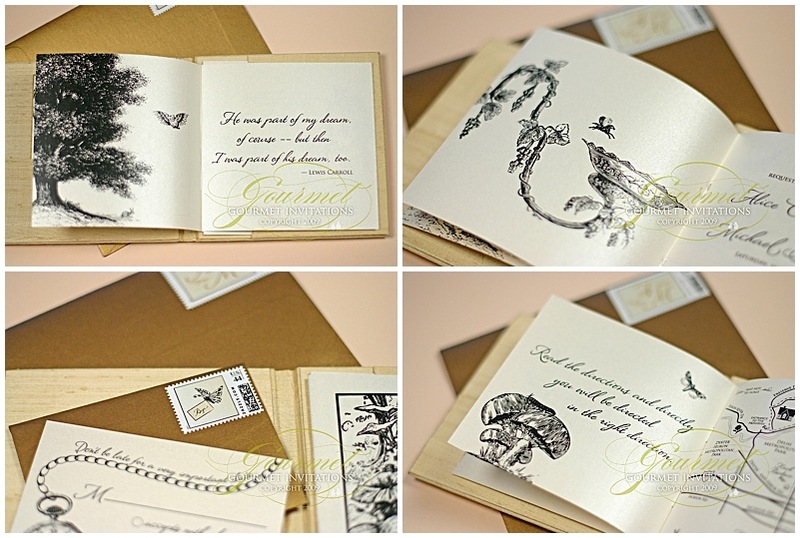 The outcome is a classy and elegant storybook invitation with a silk cover, embroidered monogram, and vintage etchings. The booklet inside has eight pages filled with sketchings and quotes. The quotes are all from Alice in Wonderland and Through the Looking Glass by Lewis Carroll. I love the pocket watch detail on the rsvp card that says “Don’t be late for a very important date”. The quote “Read the directions and you will be directed in the right direction” is on the page just before the map. Then there is the quote “He was part of my dream of course – but then I was a part of his” is on the page with a large tree and a white rabbit. All I can say is, “WOW!” These are absolutely stunning. Well done!